On the drive home from the Stein Dave and I decided to explore the old Alexandra bridge. 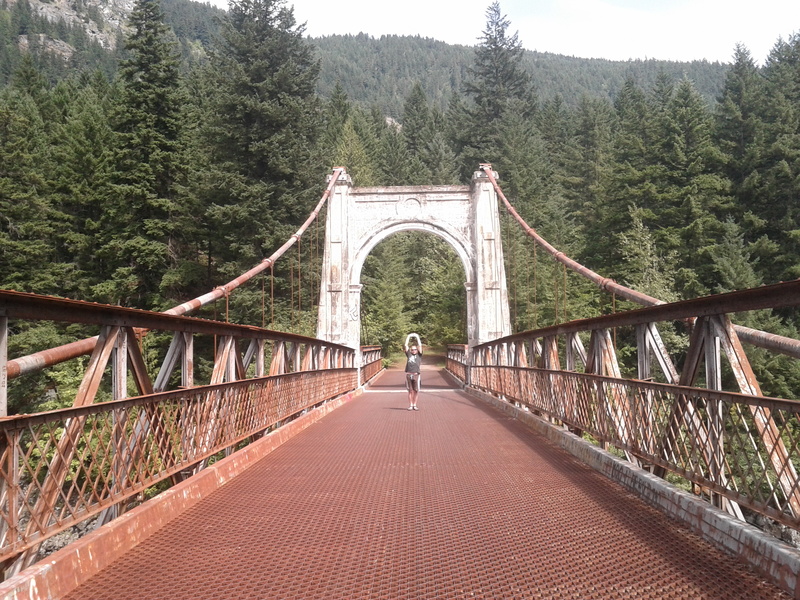 It was built in 1926 as part of the Fraser Canyon Highway and was removed from service in 1964 when the Trans Canada Highway was built. It is a really fun bridge from which to look down at the river through the gaps in the deck plating. The bridge is at the west end of a traverse I am keen to sort out with someone who is willing undertake a walk here from Zopikos Ridge in the Coquihalla. It should be about 50-70 km of alpine and subalpine hiking and light mountaineering. And a lot of gnar. This entry was posted in Adventures and tagged Alexandra, Dave, fraser canyon. Bookmark the permalink. If I’m not mistaken, I think that bridge was actually build by the Canadian Military Engineers, no? I recall as a kid crossing it many times. It’s surprising they didn’t dismantle it, as they did the Cottonwood Bridge just north of Quesnel. I do not recall who built that one, though many details were given in the nearby interpretive signage. I do recall that the bridge this one replaced was built on the same footings in 1864 by the Royal Engineers, as the Canadian Military was still a few years from itself being constructed. That one was built for wagons and substantially came down in a river surge in the late 1800’s. It wasn’t rebuilt because by then there was a train bridge and cars weren’t much of a thing yet.